Every day, millions of people use monitors to keep track of physical activity, food intake, heart rate and blood pressure. These monitors are light-weight, easy-to-use and are popular with both athletes as well as folks who want to be healthier. Since pet health is equally important, activity monitors have become very popular and can provide similar health benefits for pets. Being relatively new, it can be helpful to learn what activity trackers do and how reliable they are before purchasing one for your pet. What Do Pet Health Trackers Do? Like most technology, there are various brands of pet activity monitors that have different features. Most monitors attach directly to your pet’s collar. Some record body temperature, respiration, and even function as a GPS tracker in case your pet is lost. Pet activity monitors may also help pets that are over their ideal weight become healthier by providing owners with helpful information. Monitors can track your dog or cat’s daily activity including distance traveled, calories burned, heart rate, and overall physical activity. This data is particularly helpful for identifying any changes in activity or mobility resulting from discomfort caused by injury or disease. In addition, certain monitors may be able to gauge anxiety levels when you are not home by measuring your pet’s heart rate. 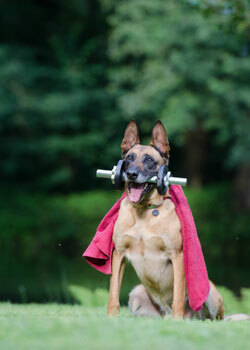 Best of all, many pet activity monitors can be synced with your smart phone. This allows you to monitor and compare your pet’s stats to your own, helping to ensure you both get the daily exercise you need to stay healthy. How Well Do Pet Health Trackers Work? While pet health trackers can monitor many different health stats, reliability and accuracy can vary depending on several factors. Quality of the tracker, range, battery life, and proper fit and use can all impact how well a monitor works. For example, if your cat or dog has a thick coat, readings may not be accurate. It’s also important to know that some monitors require a subscription to use every feature of the device. A final caution that concerns trackers with a large footprint, is the physical impact they have on your pet. For example, due to being overly bulky, some monitors are not recommended for dogs under 10 pounds. Remember you should be able to slide two fingers under your pet’s collar (including the tracker) to ensure it’s not too tight. Should I Get a Pet Health Tracker? So should you get a health tracker for your pet? The answer is, it depends. If you like hiking with your dog or playing a game of feline fishing, monitors can be a great way to track your pet’s activity levels. On the other hand, even older or less active pets can benefit from them. They can help you keep an eye on your pet’s whereabouts when you are away and even monitor their sleep. Regardless, a pet activity monitor is not intended to replace veterinary care. In short, pet activity monitors can be useful for any pet owner interested in improving a pets health. It’s also a fun way to learn about your pet’s daily activities and encourage you to exercise with your pet every day. But remember, 10,000 human steps are equal to 20,000 pet steps since they have four legs.